The Sun-style Taij Quan is called the "Open and Close Taiji Quan" or "Moving-steps Taiji Quan". 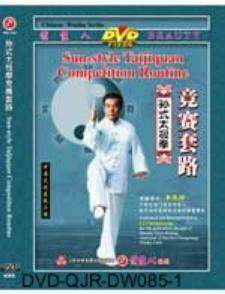 The opening and closing of hands is one of the main characters of Sun-style Taiji Quan. And it requires the "follow up step" when advancing and the "draw in step" when retreating, which is another important character of Sun-style. The Sun-style Taiji Quan was created by Sun Lu-tang, based on the traditional Wu-style Taiji Quan and selected some movements of Baguazhang (Eight Diagrams Palm) and Xingyiquan (Form and Will Boxing), so we can find the features of Baguazhang and Xingyiquan. According to the principle of tradition, rationality and competition, the competition routine of Sun-style Taiji Quan is set up with essential 73 forms based on the oks frame of this style, and compiled and examined by outstanding Taiji Quan specialists, coaches and players. So it shows the characteristics of Sun-style Taiji Quan: To coordinate the advancing and retreating of footwork and use the movement of opening and closing the hands to connect each turning.